Jonathan Rea will look to retain his crown from an increasingly formidable list of challengers. Ahead of the new MOTUL FIM Superbike World Championship season, the provisional list of entrants has been made public announcing 18 riders set to line up on the 2019 WorldSBK grid. Alongside established names of the category, many are the emerging figures that will debut in the new campaign, which will begin on February 23-24 at Phillip Island. Jonathan Rea will defend his 2018 victory as well as hunting his fifth back to back title and with that another new astonishing record. As always, the Northern Irishman will ride with the Kawasaki Racing WorldSBK Team, alongside new teammate Leon Haslam who had already competed in WorldSBK in the past. A new duo will form the lineup for the Aruba.it Racing – Ducati team. Sharing the garage with consolidated Chaz Davies, there will be Spanish Alvaro Bautista, who will debut in the premier class aboard the all-new Ducati Panigale V4R after an extensive career spent in the MotoGP paddock. Alex Lowes and Michael van der Mark will continue to ride for the Pata Yamaha Official WorldSBK team. Other two factory supported Yamaha bikes will be added to the grid with newly crowned 2018 WorldSSP Champion Sandro Cortese and Italian star Marco Melandri riding aboard the two bikes run by the new GRT Yamaha WorldSBK Team . Also 2018 STK1000 Champion Markus Reiterberger will move over to WorldSBK, forming a duo with Tom Sykes in the new partnership between Shaun Muir Racing and BWM Motorrad WorldSBK. 2019 will see the comeback of another illustrious name as Japanese Ryuichi Kiyonari will join the new Honda Corporate supported Moriwaki – Althea HONDA Racing team alongside Leon Camier. Another new Honda rider is Italian Alessandro Del Bianco (Althea MIE Racing Team) who will debut in WorldSBK at the age of only 21. Independent Kawasaki riders Leandro Mercado (Orelac VerdNatura) and Toprak Razgatlioglu (Turkish Puccetti Racing) will stick with their 2018 teams while Jordi Torres will compete with the ZX-10RR of Team Pedercini Racing. Michael Ruben Rinaldi will race full-time in the top category with the Ducati of the Barni Racing Team, while Eugene Laverty will be in the saddle of Team GoEleven’s new Panigale V4R. The 2019 FIM Supersport World Championship will have 25 riders set to line up on the grid as the Provisional Entry List released this week has announced. 2018 winner Sandro Cortese graduated to WorldSBK for the new season and will not be required to defend his crown, but the anticipation arises as many of last year title contenders will still be fighting in the class this year. Former 2017 Champion and 2018 runner up Lucas Mahias will look for his second title riding on the bike that once was of five-time World Supersport champion Kenan Sofuoglu, who retired from racing last year. Joining the Kawasaki Puccetti Racing team, he will pair up with Japanese Hikari Okubo. After having missed out on the overall victory following a dramatic 2018 season finale, another Frenchman ready to fight hard for the 2019 crown is Jules Cluzel, who will ride alongside compatriot Corentin Perolari in the all-French team GTM94 Yamaha Supported Team. A strong rival will be Swiss Randy Krummenacher who will be joined by Italian Federico Caricasulo in the Bardahl Evan Bros. WorldSSP Team. Spanish rider set to become the first woman to take up a full-time season in the FIM Supersport World Championship. History will be made in 2019 as María Herrera (MS Racing) is set to become the first ever female to take up a full-time ride in WorldSSP. 2019 will see also an illustrious Spanish representation coming from the MotoGP™ paddock with Isaac Viñales joining Kallio Racing alongside Loris Cresson and Thomas Grandingen, and Héctor Barberá heading into his first full-time WorldSSP season with Team Toth by Willirace. Nacho Calero will head into his sixth year in the class with Orelac Racing VerdNatura. Coming as well from the MotoGP™ paddock is Jules Danilo who will ride aboard the Honda CBR600RR of CIA Landlord Insurance Honda after a season in the Moto2™ class. The team will run a second bike this season again, but the name of the rider who will take the seat has not been confirmed yet. Representing the Japanese manufacturer there will also be Hannes Soomer and Jaimie Van Sikkelerus (MPM WILSport Racedays), while Rob Hartog (Team Hartog - Against Cancer) and Glenn Van Straalen (EAB Racing Team) will ride aboard a Kawasaki ZX-6R. Two Frenchmen will be filling the grid to contend the title of European Supersport Champion, Xavier Navand (DK Motor Sport) and Gaetan Matern (Flembbo Leader Team). Anticipation arises as the 2019 WorldSSP300 season approaches. 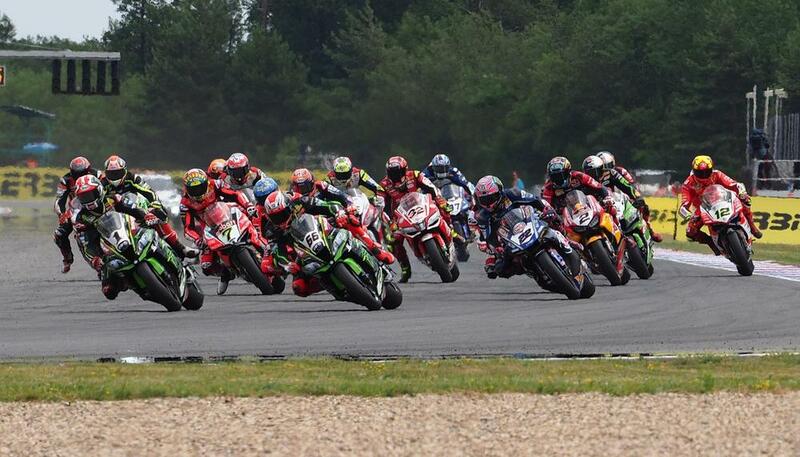 Heading into its third edition the MOTUL FIM Superbike World Championship’s feeder class will see 50 riders contending the 2019 WorldSSP300 title. Representing 5 continents and coming from 15 different countries more and more young riders will have the opportunity to gain track experience in the class this year, and with the new weekend format being announced, the 2019 WorldSSP300 season promises to be one absolutely not to miss. The first female motorcycle champion in history Ana Carrasco will try to defend her 2018 crown. The Spanish rider will be joining the brand-new Kawasaki Provec WorldSSP300 Team, which is the same structure supporting reigning 2018 World Champion Jonathan Rea in WorldSBK. The Spaniard will not be the only woman on track as fellow Spaniard Beatriz Neila and Czech talent Alexandra Pelikanova will be fighting in the class this season too. Scott Deroue will stick with the Kawasaki of team Kawasaki Motorport alongside Dutchman Robert Schotman, while Spaniard Mika Perez, another strong contender of last season, will move over to Scuderia Maranga Racing. 2019 will see the return of former 2017 WorldSSP300 Champion Marc Garcia who will join DS Junior Team. Garcia became the first WorldSSP300 Champion in history, as he won the title the same year that the series was introduced. Signing with the team that brought Carrasco’s to win the title in 2018, it will be a strong match this season. Garcia will pair up with other two Spanish riders, Angel Heredia and Francisco Gomez both at their debut on the international racing scene. Spain will be represented by a total of nine riders with Manuel Gonzalez (ParkinGOTeam) and Borja Sanchez (Scuderia Maranga Racing) other two names to keep well in mind. Joining the series full-time this year is Manuel Bastianelli (Prodina IRCOS Kawasaki), who stunned everyone last year with his performance at Misano, as he took the victory in a wildcard appearance at his home round. The rider will not be the only Italian on the grid as other eight will be standing for their country as well. Czech Oliver König and Vojtech Schwarz will be riding for the brand-new ACCR Czech Talent Team – Willi Race managed by former rider Jacub Smrz. Coming from East Europe too, Nick Kalinin from Ukraine (Nutec – RT Motorsports by SKM – Kawasaki) will be joining Dino Iozzo and Dorren Loureiro both from South Africa. Polish Daniel Blin (TERRA e MOTO) will pair up with Benjamin Tomas Molina (TERRA e MOTO), the first Chilean rider to debut in WorldSSP300. As well coming from South America, Brazilian Eliton Gohara Kawakami will line up with BCD Yamaha MS Racing alongside Beatriz Neila, Spaniard Ferran Hernandez Moyano and Frenchman Andy Verdoïa, who belongs to a list of other eight riders representing France. Indonesian Galang Hendra Pratama (Semakin Di Depan Biblion Motoxracing) will head into his second full-time season in WorldSSP300, pairing up with Italian Jacopo Facco. Following the steps of Kenan Sofuoglu, his nephew Bahattin Sofuoglu will be heading into his first full-time season in WorldSSP300. Using the same number 54 like the WorldSSP legend, the Turk will be pairing with Italian Marco Carusi in the Kawasaki Puccetti Junior Team. Australian riders Tom Edwards (ParkingGO Team), Jack Hyde (2R Racing Team) and Tom Bramich (Carlo Cox – RT Motorsports by SKM -) will all ride aboard a Kawasaki Ninja 400 in 2019. German Maximilian Kappler and Dutchman Koen Meuffels will ride aboard the KTM machines of Freudenberg KTM WorldSSP Team, while Jan Ole-Jahnig and Victor Steeman coming as well respectively from German and The Netherlands will be forming the line-up for the Freudenberg KTM Junior Team. Adrien Quinet will be the only rider to contest the 2019 WorldSSP300 season aboard the Honda CBR500R of TGP Racing.